| "The unchanging name of the best"
"The unchanging name of the best"
EFQM Excellence Model is based on nine criteria and does not include any obligations. Five of these criteria forms the "Enablers" criteria, and the other four the "Results" criteria. The Enabler criteria covers the activities which an organization does. And the Result criteria represents the things that an organization has achieves. Results originate from enablers. 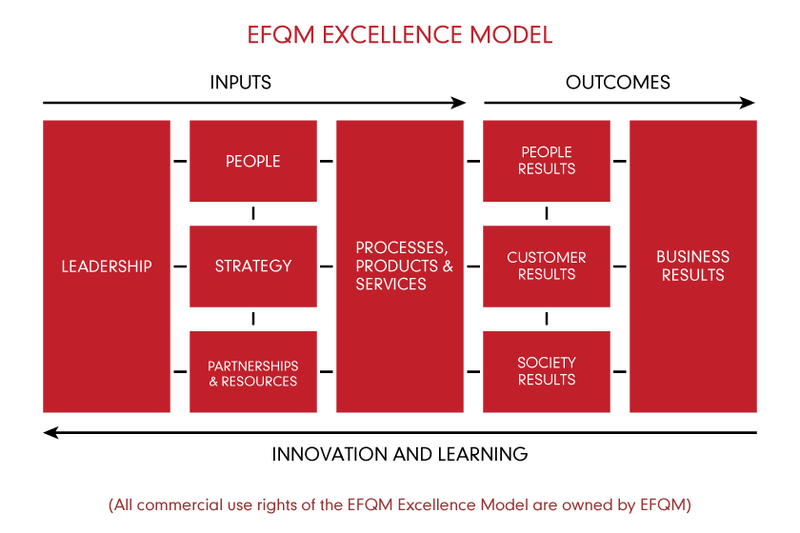 EFQM, is based on eight key elements which are defined as "the fundamental concepts of excellence". The model in built on the fact that there could be many approaches in order to achieve a sustainable excellence at all dimension related with performance, and based on the following expression: Excellent results reflecting on performance, customers, employees and society can be achieved by directing the strategy, employees, resources and products, services and processes with a proper sense of leadership. DGS is proud to be the first and only company that implements the EFQM Excellence Model in its sector. E-Mail Address Required value.Invalid format. Phone Number Required value.Invalid format. DGS Plaza Zümrütevler Mah. Atatürk Cad.